Woke feeling like I had been bitten by bed bugs. Not such a comfortable nights sleep on the thin mattresses provided in the church hall. I quickly packed and left getting the church stamp in my credencial on the way out of town. It was still cloudy and light rain started again. The country was changing with pine trees appearing. Continuing to climb the way led into some forests and the earth was more sandy. 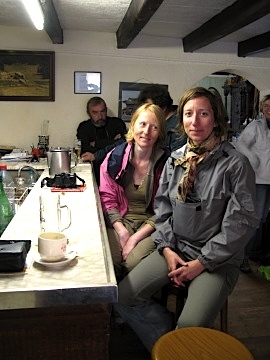 After ten kilometres there was a small cafe ran by Régine Soulier who was apparently well known on the Way of St James. The cafe was open all year and due to its isolation, everyone stopped there. When I arrived indeed everyone was there warming up with a morning coffee. The talk was of the path ahead. Someone had said it was flooded and it was better to use the road. Most people ignored the advice. The path was very very wet and some parts took a while to negotiate but it was not impassable. Shortly after we were on the Plateau d’Aubrac. The plateau was wild like the moorlands of Scotland or Ireland with old stone dykes dividing the land. There were large boulders everywhere. The wind was blowing and it had a wonderful eerie feel as the cloud came and went. Arriving at the small village of Finieyrols I set up the gas stove for some hot mushroom soup. Marie and Sophie arrived and we had some hot coffee too. I was happy that I had brought the gas cooker for weather like this. The way continued on through largly unpopulated rough farmland to Nasbinals. The gite communal was full so I went to the supermarket and bought some bread and cheese. In the middle of town there was a fantastic stall selling the local cheeses. They were superb. Back at the gite the lady in charge pronounced that I was lucky as there was one bed left. I didn’t fancy camping out that night. The gite was full of ‘car pilgrims’ with clean shoes and clothes while those walking the way had to find more expensive accommodation. I started to think of the injustice in France of being able to book the gites in advance.